" Energy and Climate Change Secretary Ed Miliband has outlined Government’s latest measures to help householders save money and energy as he welcomed 10:10 ? 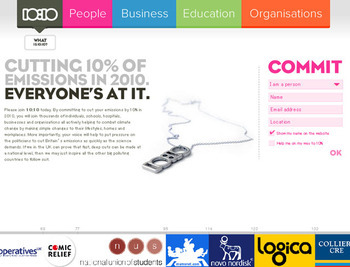 a new campaign to cut carbon emissions by 10% in 2010. Around 90,000 homes in some of the poorest areas in the UK should see an average saving of 20% per year in their emissions through a new community based energy saving scheme which starts today. This amounts to financial savings of around ￡300 per year off fuel bills. In the past year, more than 1.2 million homes have received some form of insulation under the Carbon Emissions Reduction Target with enough professional loft insulation installed to stretch from London to Sydney and back. The number of households getting this help through energy companies has been increased, with Government recently increasing the target by 20%. Responding to the 10:10 campaign, the Department of Energy and Climate Change has confirmed that it is on course to cut its own emissions at its London headquarters by 10% by April 2010 and it will make further reductions through the rest of 2010 and beyond. DECC staff have been encouraged by Ed Miliband to join him in taking up the 10:10 pledge in their homes and lifestyles. ・A new Community Energy Saving Programme starts today. Around ￡350 million will be spent by energy companies over the next three years to deliver whole house, whole street energy makeovers concentrating on some of the most vulnerable people in the UK. ・The Carbon Emission Reduction Target (CERT), an obligation on energy suppliers to promote household carbon reductions is operating at a higher level than ever before, with the target recently increased. In 2010 topping up a loft could contribute around 2% to a 10% saving. ・In 2010, we’ll start trialling “Pay As You Save”. This is a new way of paying for whole house energy retrofits as part of our commitment to treat 7 million homes by 2020. From today the EU will be phasing out old fashioned 100W and all pearl light bulbs. Money saving energy efficient ones will replace them.